Headquartered in Bethesda, Maryland, Clark Construction Group, LLC, performs in excess of $1 billion of work annually in the National Capital Region. Over the last decade, the firm has built some of the largest and most complex projects in and around Washington, D.C., including the Walter E. Washington Convention Center, NGA Campus East, Nationals Park, and U.S. Coast Guard Headquarters. All of these projects were successfully delivered with a keen focus safety, quality, and local participation. Clark, in association with its heavy civil subsidiaries, performs all manner of heavy/civil work, including heavy rail, light rail, highway and bridge, and water and waste water construction. Additionally, the company has more than 40 years of underground construction experience, and has built 35 projects for MWAA and WMATA. Clark has extensive experience delivering projects through a variety of contracting methods, including design-build, construction manager at-risk, PPP, and general contracting. The Kiewit Infrastructure South Co., builds civil infrastructure projects throughout North America. 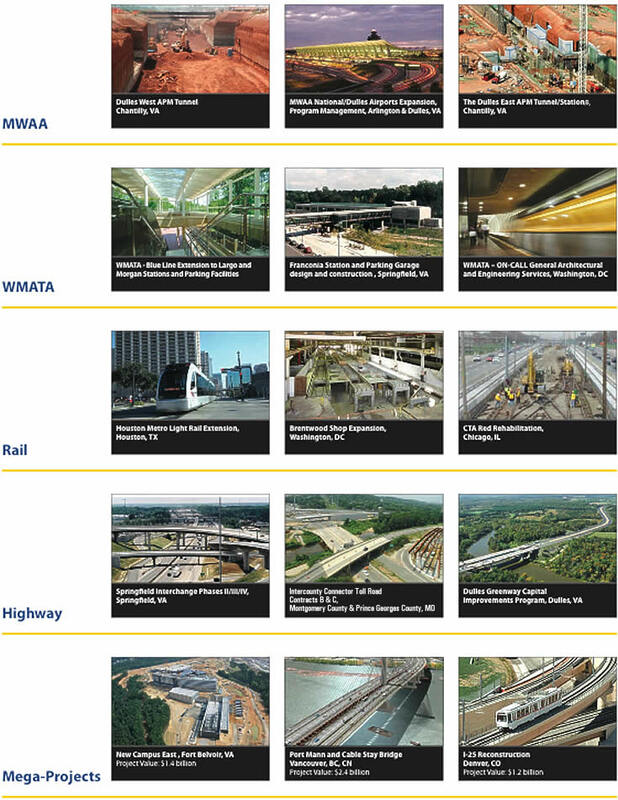 Kiewit’s experience encompasses a wide range of services, including development, track construction, elevated train stations, tunnels, service and inspection yards, traction power, signal and systems, airfield runways, toll road, freeway to freeway interchanges, and parking garages. Kiewit has provided these services to major transit agencies, class 1 railroads, aviation authorities, county public works, and department of transportation entities across the U.S. and Canada. Supported by one of the largest private equipment fleets in North America, and with one of the largest bonding capacities of any general contractor, Kiewit has the resources and financial strength to complete any project on schedule with an emphasis on safety, quality, and environmental compliance.